It seems, nowadays, that reality competitions change their rules as much as parents change diapers, and last night's "The Voice" was no different. The popular singing contest kicked off its first live playoffs with a few twists and turns. This week, there will be three episodes instead of two, and the audience will vote for eight of the 12 contestants they want to see in the live shows next week. 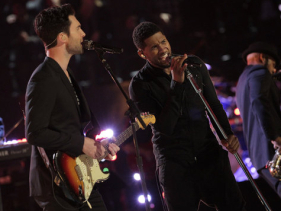 In a jam-packed and entertaining episode, coaches Adam Levine andUsher took to the stage to perform for the first time together to "Superstition," while their remaining four-team members sang for their future in the competition. It seems like a given for the man who signed Justin Bieber, but no one expected the R&B powerhouse to be as hands-on as he was with his team. In an attempt to increase their stamina for singing and performing, Usher took his team kickboxing. He then waltzed with Cathia to teach her voice to dance, and in a touching moment brought Michelle Chamuel to sing in front of a mirror, in an attempt to see her inner beauty. Usher was innovative, passionate and imparted great advice. "Incredible" seemed the only word judges could find to describe Team Adam's Sarah Simmons. Performing an emotional rendition of "Angel" dedicated to her late best friend, Simmons captured the audience with her "sweet soul" and "angelic" sound. Shelton told his team (offstage) to watch out for Simmons. Levine took it to a whole other level, saying, "You're one of the most incredible singers to listen to in my life." Who would have thought the ousted Team Shakira member would turn into such as asset for Usher? The powerhouse Latina stepped up to the plate when taking on Whitney Houston's "I Have Nothing," belting the tough song with conviction and zeal. While Shakira felt "Taking on Whitney Houston is like stepping on holy ground," Usher believed Cathia needed to make a bold step to be truly heard. Well, it worked. We're certainly listening. As the quirkiest member of Team Usher, Michelle Chamuel has been known for being a unique personality. Monday night, though, she proved herself to be a real singer. Realizing she was "different" from a young age, Chamuel connected to the lyrics of "True Colors," wishing someone would help pick her up the way she tries to pick up others. When Usher made her sing to herself in the mirror, you could almost feel her energy shift. Levine and Shelton called her the "breakout" star of the night but the most heartfelt praise came from coach Usher who said, "We all possess what we need to be our greatest selves ... you made a connection they will never forget." "The Voice" live playoffs will continue tonight as Team Shakira and Team Blake take the stage, in hopes of winning the audience vote. Coaches will have the ability to save one of their four team members with the top twelve set to be revealed on Wednesday.